According to a live poll on the YouGov website, you – like 64% of other Britons at the time of writing – may be suffering from a rather severe sounding condition called “Brexit fatigue”. Symptoms may include shoulder shrugging to illustrate complete indifference, the urge to get undressed, and a general feeling of foreboding. If you recognise any of these symptoms in yourself, you may want stop reading right now. Asset class returns in sterling and local currency are below; it was a good week for almost every major asset class in local currency terms, though a rising pound acted to depress the value of foreign assets. 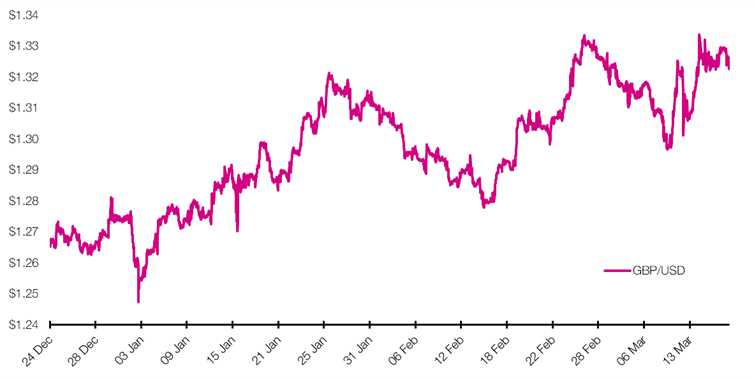 Two weeks ago we looked at how UK government bonds were reacting to the prospect of fresh Brexit votes and their implications. Having once again failed to command the support of MPs for her Withdrawal Agreement, Parliament was allowed to express its view in a series of indicative non-binding votes last week. These showed support for blocking a “no-deal” exit, blocking a second referendum, and favouring an extension to the Article 50 process thereby kicking the proverbial can down the road. Still, a lack of any real change in circumstances did not prevent dramatic swings in the UK’s currency ahead of last week’s votes as optimistic investors were swept up in a rapidly evolving news environment. In just the 24 hours prior to the vote, market participants had to interpret the UK Prime Minister flying to Strasbourg to secure last minute concessions, a joint statement by the European Commission President and Theresa May along with a new “joint legally binding instrument”, and the issuance of fresh legal advice by the UK’s Attorney General. With any extension of the withdrawal process contingent on the unanimous agreement of the remaining 27 European Union member states, last week’s political chicanery leaves the UK in an entirely unchanged position: we will exit the EU on March 29 with no deal unless either 1) the Withdrawal Agreement passes through UK Parliament, 2) Article 50 is extended, or 3) the UK unilaterally decides to reverse its withdrawal. If a third vote on the Prime Minister’s deal does indeed go ahead on 19 March, the UK may still need a short extension to the Article 50 process in order to pass the necessary legislation. However, if the Withdrawal Agreement is once again rejected by Parliament then it is likely the UK faces a choice: proceed with a no deal exit, or seek a lengthy extension to the Article 50 process in order to assess the next steps. STAT OF THE WEEK: 38% and 43% – the percentage of Britons who want MPs to vote for and against a Brexit delay (YouGov).